We’ve just published version 1.20 of our Outlook duplicate removal software. The changes are mostly details: An improved registration dialog and a bugfix for a very special case. For more information about the software, please visit the product page of 1-Click Duplicate Delete for Outlook. Furthermore we’ve improved the wizard that helps you set up new task in some details. The update is (as always) free for our existing customers. For more information please visit our file sync page. 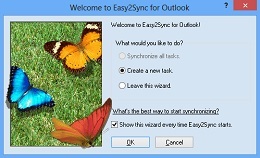 We’ve just published the new version 2.07 of Easy2Sync for Outlook. The new version includes some fixes and changes and a new filter. 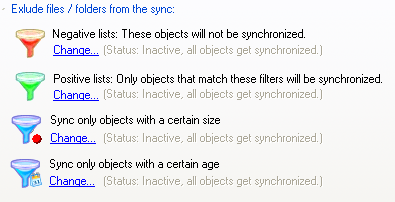 It’s now possible to filter objects by their type. For example you could exclude all contacts from the sync, no matter in which folder they’re stored it, just by activating the respective filter. As always the update is free for all existing users. For more info about the software please refer to the outlook sync pages.